"This tattoo was done at Iron Brush Tattoo in Lincoln, Nebraska by Nate Deal, two days after I successfully defended my poetry dissertation at the University of Nebraska-Lincoln. The design has multifaceted meaning. The words, 'Everywhere I go I carry home on my back,' are an adaptation of a quotation from my favorite Chicana poet/activist, Gloria Anzaldúa. In her book Borderlands/La Frontera: The New Mestiza, she writes with blunt, yet graceful clarity about the emotional difficulty women of color, women of mixed ethnic/racial backgrounds, and queer women face. In the specific chapter the quotation 'I am a turtle, wherever I go I carry home on my back' appears, she is referring to the fact that no matter where she moves or how much education she acquires taking her farther away from the experiences of her family, she carries her Mexican (American) culture with her always – new environments cannot erase our history; ethnic culture is a quintessential part of her, familiar, and a protection, like a turtle’s shell. Reading this book helped me be able to articulate the pain and anxieties I had regarding my own socioeconomic position (working class kid in 'the academy'), my belonging to Mexican and American cultures (Mexican dad, white mom), and my multifaceted feelings about gender, sexuality and identification. Reading Anzaldúa’s experiences and her advocation that people should embrace all aspects of our history and personality, even when they may seem contradictory, or go against what the dominant culture tries to push us toward, provided me the strength to keep pursuing this degree that no one else in my family has earned, in a state I had never lived in before (I moved from CA to the Midwest), and to know more clearly what it was that I wanted/needed to write about. The fact that I've always loved turtles, made having that image from the quotation a given. What I added (and Nate did an amazing job capturing!) is the book that is lying open over the turtle’s back. The turtle symbolizes conceptions of culture and self, yes, but the book represents my ability to find 'home' in literature and writing. Even when I have felt the most scared, the most alone, and the most frustrated, I've been able to write and read my way into understanding and acceptance, both of myself and others. Poetry in particular is 'home' that I am able to carry with me. Getting to see this image and those words every day reminds me it is not despite my background that I've been able to work hard to make my dream of talking about and writing poetry a reality, but because I learned to embrace it. Lastly, something else that made this experience so amazing was that even though I only brought him a very crude drawing and an explanation of what I imagined in my mind, Nate was able to sketch out exactly what I wanted. Particularly in the turtle’s face. I think I said something like, 'not too cute, but not too lizardy or snake-like, and not mean but not cartoonish.' His talent and intuition as an artist and genuine compassion and interest in other people’s experiences helped him see into my ridiculous description to what I really wanted. I wouldn't hesitate to go back to him for my next tattoo." Nate Deal is now at Black Anchor Tattoo in Cambridge, Maryland. Nate's Instagram is here. Sarah sent us this poem, as well, which was originally published in Blood Lotus Issue#19, and is part of my full length manuscript, Hands That Break & Scar. raised my eyebrows high and said, Hell no. planted marbles, rubber balls, love notes. a ride home in his white, lowered El Camino. Come here, baby, I’ve got something for you. above the clean, shining door. starting the“1” of the number thirteen. Sarah A. Chavez, a mestiza born and raised in the California Central Valley, is the author of the chapbook, All Day, Talking (Dancing Girl Press, 2014), which was featured on Sundress Publications' book spotlight, The Wardrobe's Best Dressed. She holds a PhD in English with a focus in poetry and Ethnic Studies from the University of Nebraska – Lincoln. Her work can be found or is forthcoming in Stirring: A Literary Collective, Spoon River Poetry Review, Luna Luna Magazine, among others. Her manuscript, This, Like So Much, was an Honorable Mention for the 2013 Quercus Review Press Poetry Book Contest. A selection from her chapbook manuscript All Day, Talking won the Susan Atefat Peckham Fellowship in 2013. She is a proud member of the Macondo Writers Workshop. Visit her at www.sarahachavez.com. 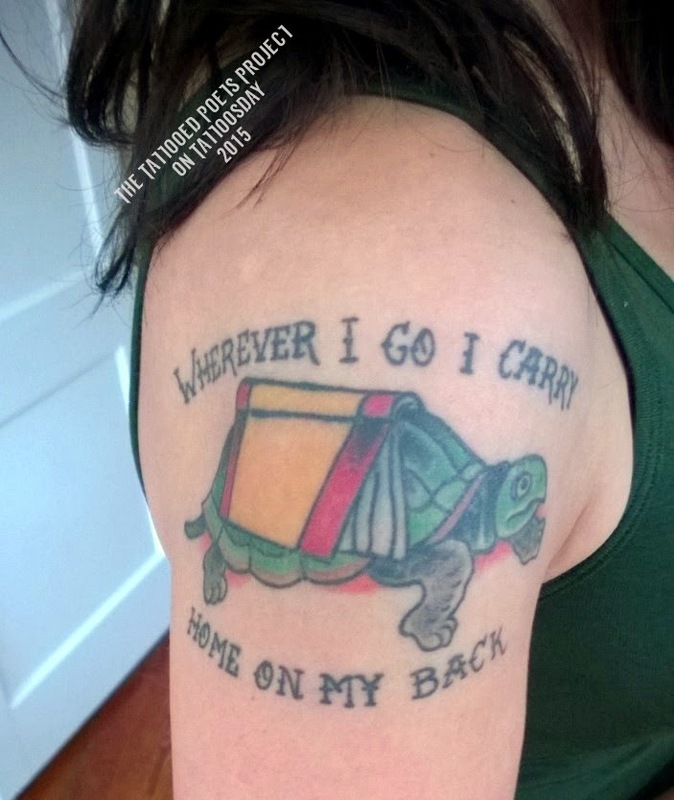 Thanks to Sarah for sharing her literary turtle tattoo with us here on Tattoosday's Tattooed Poets Project!